The 6.5 Grendel is one of those periphery platforms you hear about from time to time that has a small, but growing, vigorously dedicated following. Claims are that this can be your rabbit-to-elk cartridge, but most hunters use it as a medium-size deer/hog/varmint gun and are quite happy with the performance they are getting. However, references to big game kills are more of the exception than the rule. Developed for the AR15 by Bill Alexander (of Alexander Arms) and Janne Pohjoispää as a long range AR15 cartridge, the Grendel’s superior ballistics derive from having a high ballistic coefficient and a high sectional density as compared to similar calibers of comparable weights. The net result is that you have an aerodynamically efficient, accurate bullet, with the potential for excellent penetration, all from a fairly low recoiling cartridge that is fired from the über-versatile AR15 platform. I went through several calibers and platforms before settling on the Grendel AR15. In 2008, I went with big bore lever .45-70 for big hogs that had invaded my property. It did an outstanding job, but was too much recoil for most night vision gear. So I went with an AR15 in .223. After trying a few different cartridges, I found the performance to be lackluster for hogs. 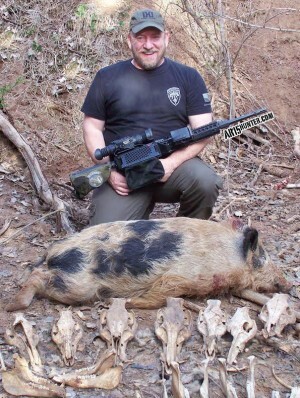 This was about the time that I started helping my neighbors with feral hogs and hog recovery was important. From there, I moved up to a .308 bolt gun that offered plenty of power and penetration, accepted night vision, and was far superior to .223. Hunting success improved and I started videoing my hunts. Unfortunately, I had a surgery that temporarily ended my use of higher recoil guns. I would have to return to the .223 and one of my landowners was not happy with that. A friend suggested that the Grendel was the answer to my problems – moderate recoil and all kinds of lethality. It seemed too good to be true, but I researched the Grendel and compared it with its much more popular rival, the 6.8 SPC. Both were very good choices. The shortcomings of the Grendel are a lack of manufacturers and not many commercial ammo offerings. If you were building your own rifle (which apparently a lot of Grendeliers do), then you had a lot of choices, but when it came to buying complete rifles or just uppers, your choices were limited. If you reloaded, then ammo wasn’t a problem. At last count, there were more than 100 Grendel bullet offerings (6.5mm/.264″) that can be found for reloaders. 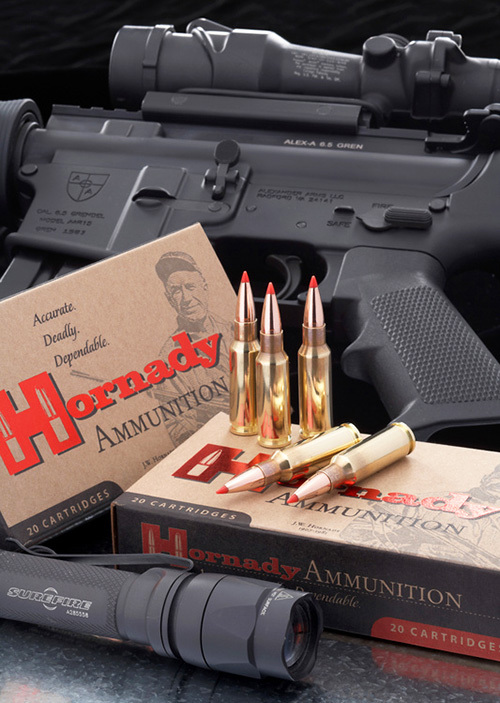 Current ammo producers are limited to Hornady (2 loads), Wolf (3 loads), Precision Firearms (9 loads), and various offerings from Alexander Arms (currently 7 loads offered). The 6.8 had all sorts of rifle manufacturers, bullet makes, and lots of commercial ammo selections. Swayed by the penetration potential and uniqueness of the Grendel, it became my choice. One of the reasons the Grendel has such a loyal following, it seems, is that so many people build their own rifles and enjoy developing their own loads. Unfortunately, I am not one of those people. Instead, I went with an Alexander Arms upper with match 20” Shilen barrel and mated it with an LMT lower with a 2 stage match trigger. I sighted in the rifle initially with a Pulsar N750 digital night vision scope and later with an Armasight Zeus 3 640 thermal scope. I have hunted with magazines made by AR-Stoner, ASC, and C-Products. Capacities range from 5 to 26 rounds. I generally hunt with a 15 round ASC magazine. On my best days, 3⁄4 MOA is possible with the Hornady SST ammo that chronographs at just over 2500 fps from my rifle. A brief survey of other Grendel owner’s data online reveals velocities of ~2900 fps with lighter 90 gr. bullets and ~2700 fps with 120 gr. bullets out of 24” barrels on the high end and just 200-300 fps slower from 16” barrels on the low end. 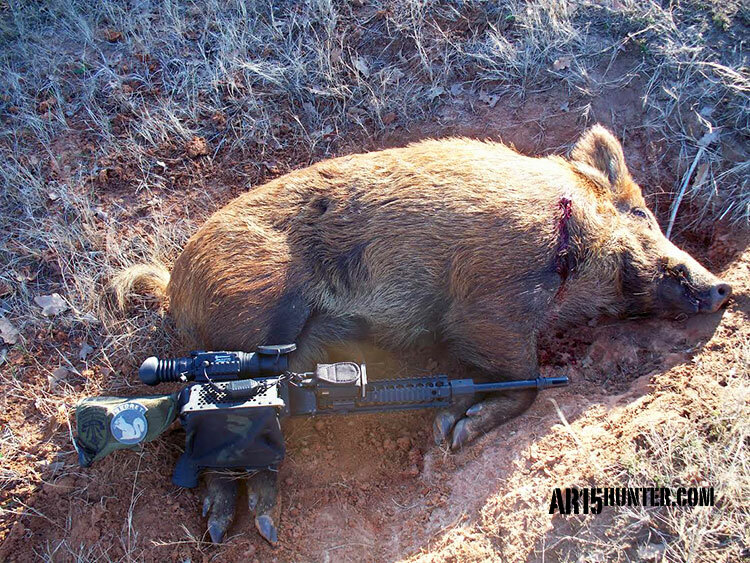 One of the first things I noticed when I started hunting with the Grendel was that I was getting a lot of transverse and quartering through and throughs with the SST ammo, even on large hogs. This sort of terminal performance was what I had seen with the .308. This is not to say that the 6.5 Grendel in Hornady SST is an equal cartridge to the .308, but that when it comes to terminal performance on hogs, I would be hard pressed to tell the difference. 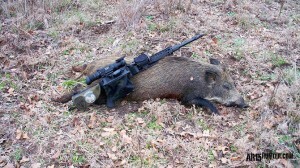 Wild hog dropped with the 6.5 Grendel. The Grendel also seems to shine, taking full advantage of its high ballistic coefficient, when hunting at greater distances. 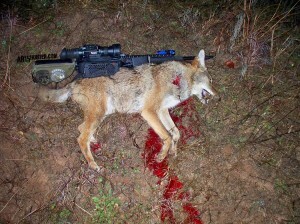 Online accounts of hunters taking deer-sized game at 400-600 yards can be found. These distances are beyond the norm for the vast majority of hunters, but the Grendel certainly offers something special for those who want to stretch their legs a bit further in an AR15 without the recoil of AR10 calibers. 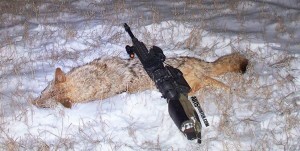 No doubt the Grendel remains outside of the main stream of hunters and as a result is overlooked by many manufacturers. This may be its greatest detriment. The Grendel does seem to be slowly gaining in popularity, a testament to its following and performance. 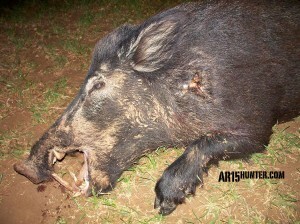 To date, I have taken 43 hogs, 10 coyotes, and 6 bobcats with the Grendel. Distances have ranged from 20 yards (bobcat) to 205 yards (hog) with most taken at night. 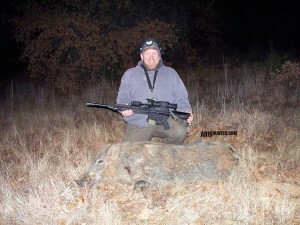 I still break out my other rifles from time to time, but since finding it, I have made the 6.5 Grendel AR15 – my go-to gun for hogs and predators.